When walking, your heels repeatedly hit the ground with considerable force. They have to be able to absorb the impact and provide a firm support for the weight of the body. When pain develops in the heel it can be very disabling, making every step a problem and affecting your posture. Pain can also occur in the mid-foot or along the toes. Getting a diagnosis from your Chiropodist or Osteopath is the first step towards treating your condition and helping you to walk pain-free again. 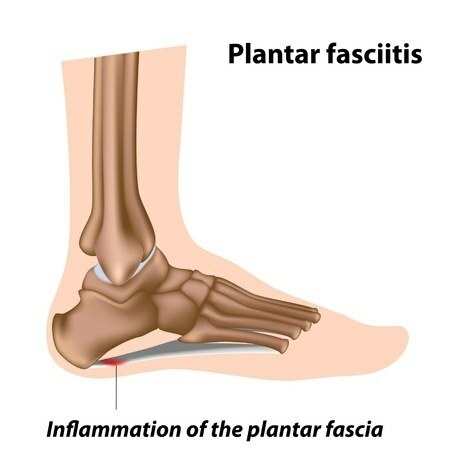 Pain over the sole of the heel (plantar surface) is generally described as heel spur syndrome or plantar fasciitis. Heel Spurs are a natural development of the bone when excessive strain is placed on the structures underneath the foot. Pain becomes worse on standing, particularly first thing in the morning when getting up from bed. It is relatively common though usually occurs in patients over forty, the incidence increasing with age. There are no visible features on the heel but a deep localised painful spot can be found in or around the middle of the sole of the heel. It is believed that tearing at the attachment of the ligament causes inflammation leading to pain. Although it is often associated with a spur of bone sticking out of the heel bone (heel spur syndrome), approximately ten per cent of the population have heel spurs without any pain. With heel spurs or plantar fasciitis, cushioning for the heel often has little value. Your Chiropodist may try padding and strapping to alter the direction of stretch of the ligaments. This is often successful at reducing the tenderness in the short term. One treatment option is the use of a low level laser to stimulate the healing process. In the long term you may need prescription insoles (orthotics) to help the feet to function more effectively, thereby reducing strain on the ligaments and making any recurrence less likely. If pain from heel spurs continues, you may be referred to you GP who can prescribe a suitable non-steroidal anti-inflammatory. Alternatively, localised hydrocortisone injection treatment may be given by the GP or your podiatrist. Pain at the back of the heel can be caused by inflammation of a bursa (fluid filled sac) at the back of the heel. It is normal to have bursae separating tissues that may suffer from friction, such as between the Achilles tendon and the heel bone. However, if the bursa becomes inflamed it can be painful. Heel bursitis can be caused by footwear rubbing on the back of the heel. It may also be caused by infection. Pain is usually felt when the ankle joint is moved and there may be a swelling on both sides of the Achilles tendon. In most cases, attention to the cause of any rubbing and appropriate padding and strapping by your chiropodist will allow the inflammation to settle. If infection is present, your chiropodist will refer you to your GP for antibiotics. These occur at the back of the heel as firm swellings which become prominent and may rub against shoes. Adjustments to footwear is often enough to make these areas comfortable. A leather heel counter or wearing boots may help. However, if pain persists surgery may be necessary.